Comcast has been adamant about being the highest price big dog and I don't disagree in as much as they typically have been the most reliable internet I have ever used, but I have just about had it. Their triple play bundle, even at 'discounted' pricing has been costing about $160/mo and I am sick of it. We never use our home phone and I would just as soon cancel cable as not. Of course, Comcast's pricing structure makes internet very expensive if you don't bundle. $45 for 1.5 Mbps with no bundle and nearly $70 for their fast internet with no bundle. This includes their $7.00/mo modem fee. I highly recommend buying your own modem as it will pay for itself in about 6 months. There was a day they were pretty good about giving discounts to match whatever was being offered new customers every so often if you called in and had been a customer with them for so long. But those days seem to be gone. Their pricing model must figure once they get a customer, screw them for whatever you can as long as you can until they leave; no discounts, no breaks, just squeeze. So..... I feel squoze. Now I want to leave. 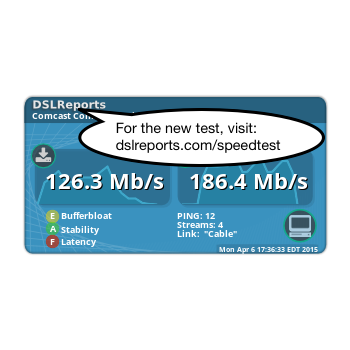 After several rounds and several months of trying to get a reasonable bundle/deal/whatever for internet compared with other theoretical alternatives (Qwest, Clear, Digis) I decided to just drop everything with Comcast and use their basic internet which is 1.5Mbps down, 750Kbps up or so. I recently decided 1.5Mbps was plenty fast for me. However, I need to be approximating 1.5Mbps down for that to feasible. With my OWN modem, Comcast has raised their basic cable to $38.00. Add $7.00 if you don't have your own modem. Up until now, Qwest has been the only feasible alternative but I have disliked Qwest more than Comcast -- but I am about to throw up my hands and disavow Comcast forever. I have tried Clear ($45/mo for up to 6.0Mbps, $35/mo 2Mbps, no caps) , Digis ($35/mo 7.0Mbps, $30/mo 2Mbps, restrictive caps) recently and had Qwest DSL in the past. Clear and Digis don't really perform well enough in *MY* area, though I am sure they are fine elshwere. I really really wanted Clear to work but I am in a black hole right in the middle of two towers. I could get some coverage, but it was spotty and odd. I built some reflector boxes to try to boost signal but it did not help enough. It did get my UPLOAD speeds to about 780Kbps but downloads would rarely get abouve 400 or 500Kbps. Even worse without the reflector boxes. There are no external antennae on the Clear modem and I wasn't going to mess with cracking it open and buying specialized connectors for the U-FL internal connectors plus the external antennae necessary to gain enough to make this worth it with the pretty likely outcome that I could not do too much better than the reflector boxes. I don't have a line of sight (LOS) to either tower so a true directional or can would probably NOT help enough anyway. Qwest has tradtionally been very spotty, used horrible modems that would lock up frequently, had bad backend support, and mediocre speeds But they have been making big strides in all those areas. I am starting to think Qwest might be a bonafide contender once again. Just to spite Comcast, I think it might be worth it. Honestly, how could it be worse than the speeds I am getting now? Sad Speeds, Sad Comcast. Truly PATHETIC speeds. PATHETIC!!! Here are some speed tests done throughout the day. Some of them are bad, and some are pathetic. None of them are good.